Just as 'Everything is bigger in Texas,' our event was bigger and more spectacular than ever before. The city of Austin, the capital of Texas, is known as the Live Music Capital of the World and is home to some of the most beautiful parks and lakes in the country, as well as the largest urban bat colony in North America, which resides under the Ann W. Richards Congress Avenue Bridge overlooking Lady Bird Lake. This historic, vibrant locale is where Today's Dietitian (TD) held its 5th annual Spring Symposium on May 20–23 at the Hyatt Regency Austin. The symposium was a stupendous continuing education and networking event, attracting more than 600 dietitians, certified diabetes educators, medical doctors, DTRs, dietetic interns, sponsors, and volunteers from across the country, Canada, the Cayman Islands, Ecuador, Mexico, and Australia. Attendees included dietitians in clinical and private practice, consulting, marketing, diabetes care, education, research, media, foodservice, supermarket retail, government, community dietetics, and corporate wellness. More than 40 sponsor companies supported the event, and 24 of the biggest names in the nutrition profession gave passionate, informative presentations on pioneering research in disease prevention and management and critical care, the latest trends in nutrition counseling, media, culinary education, professional ethics, diabetes, the gut microbiota, social media, food waste, hunger, and more. "I enjoyed the conference. You guys did an amazing job!" said Megan Boitano, MS, RD, owner of a private practice in Massachusetts, and founder of RD2RD.com, an online marketplace where dietitians share, sell, and buy original content via digital downloads. "This was my first time attending your symposium, and I've made new connections. I felt like everyone was willing to grow and take risks. It was a different vibe. People were raising their hands in sessions and asking questions, and you covered such a broad swath of topics." Patricia Gentile, RD, a dietitian at Whiting Forensic Hospital in Middletown, Connecticut, said she "loved" the symposium. "It was more intimate than the larger conferences." Like last year, TD created a social media firestorm. Attendees tweeted a barrage of comments and photos in real time to #TDinAustin to the point where we were trending No. 1 on Twitter for two days. To jumpstart the symposium, TD's own nutrition editor, Sharon Palmer, RDN, aka The Plant-Powered Dietitian, organized and led the food and farm tour for a second year. United Sorghum Checkoff sponsored the tour. A group of 48 attendees, including dietitians, presenters, and sponsors, joined Palmer for a full day of touring and learning about Austin's food and farm scene. Despite the intermittent torrential downpours of rain, attendees had a great time networking, breaking bread, and learning about the food system in the region. They visited the American Botanical Council, where they learned more about the evidence on food as medicine and toured the edible and medicinal demonstration gardens. Afterward, attendees visited a sorghum farm, where they discovered how sorghum is grown, its nutritional properties, and its culinary uses. Later, the group ate Texan cuisine for lunch at the home of Wayne Cleveland, executive director of Texas Sorghum Producers, where they listened to a spirited discussion on sustainability. On the bus ride back to Austin, attendees learned about food insecurity and food recovery programs in the historic city. Their last stop was Urban Roots Farm, a nonprofit using food and farming to change the lives of young people and bring nourishment to the community. To learn more about the food and farm tour, visit RDLounge.com/2018/06/01/tds-austin-food-and-farm-tour. Attendees who didn't go on the farm tour got a chance to sit in on the first workshop of the symposium, "Ditching DIET From DIETITIAN: Creating Our Future Focused on Well-Being, Not Weight," presented by Rebecca Scritchfield, RDN, an award-winning Health at Every Size dietitian, certified exercise physiologist, and author of Body Kindness. Scritchfield captivated the audience as she discussed the latest research and global trends for a weight-inclusive approach to living and nutrition counseling. She reviewed tools and counseling skills for non-diet approaches that can precipitate lasting permanent change. She discussed case studies where MNT intersects with weight-inclusive approaches to care, brainstormed ways RDs can help clients create better lives and reduce weight stigma in the culture, and passed her mic around to answer several questions from attendees. "Loved this workshop," said Kristine Kittridge, MS, RD, LD, a clinical dietitian at St. Mary's Health System in Lewiston, Maine. "Rebecca is a rockstar, and this is the conversation all dietitians need to be having." Jennifer Senecal, MS, RD, a clinical and foodservice dietitian in Sunnyside, New York, said, "This was a phenomenal way to begin the conference. To bring Rebecca's perspective on body kindness and introduce it as a valid, sane, and useful approach in the field of dietetics was so appreciated. … Excellent!" This year's keynote address was sponsored by The a2 Milk Company® and presented by the highly acclaimed Trace Sheehan, writer and producer of the feature film Food Evolution, a documentary that explores the controversial subject of GMOs in agriculture and, in particular, the public discussion regarding genetic engineering of food. During his presentation, Sheehan showed several clips from the movie that featured diverse views of thought leaders from all sides of the GMO debate. Following the keynote, attendees participated in a thought-provoking discussion session, which similarly reflected numerous viewpoints among symposium attendees. In addition to the opening workshop and keynote presentation, there were several session favorites among attendees. One of them was "Talking Food, Nutrition & Trends: From Baby Boomers to Gen Z," presented by Marisa Moore, MBA, RDN, LD, a communications and culinary nutrition expert and consultant to food and nutrition companies. Moore's upbeat, engaging personality had the crowd clapping and roaring in laugher as she broke down key characteristics of the different generations (ie, baby boomers, Gen X, millennials, Gen Z) and discussed their likes and dislikes, demographics, and psychographics, and the various communication strategies dietitians can use to get each generation's attention and effect change. "This was a great session from a dynamic speaker. Bravo!" said Jennie Hammerbacher, RDN, LD, school nutrition director with Kilgore ISD in Arp, Texas. "[Marisa was the] best presenter of all the courses I attended," said Wyn Lewis, LN, MPH, a private practice owner in Sante Fe, New Mexico. "It was informative, thorough, and practical. It made me proud to be a dietitian." Another favorite was the session "Going Live in 3, 2, 1: How to Navigate the World of Live Streaming to Promote Sound Nutrition and Your Brand," presented by Deanna Segrave-Daly, RD, co-owner of Teaspoon Communications, a food-focused nutrition communications group that consults with a variety of health and food organizations. Segrave-Daly discussed the importance of using live streaming to communicate nutrition messages and the live streaming platforms available. The best part was her step-by-step demonstration on how to film a live Facebook video. "I really enjoyed this presentation," said Laura Casterline, RD, LD, owner of Nutrition in Motion, LLC, in Merrimack, New Hampshire. "Deanna gave many tips and tricks that will help me improve my future experiences creating and posting live videos." Mary Agnew, RDN, nutrition education manager at Central Texas Food Bank in Austin, agreed, saying, "I thought she did a great job of showing us how to do a live video. I really liked that she showed us the equipment we'd need. She was also realistic about price and what was worth getting and what you can do without." And while there were many other incredible sessions, the one that closed out the symposium with a bang was "Culinary Boot Camp for Dietitians: Top 10 Cooking Mysteries Solved," presented by Michelle Dudash, RDN, a Cordon Bleu-certified chef and author of Clean Eating for Busy Families. While performing a variety of cooking demonstrations and encouraging audience participation, Dudash wowed the crowd with innovative techniques on how to cook protein foods to maximize flavor and juiciness, methods for enhancing flavor and appearance of vegetables and whole grains, and information on the best tools and kitchen equipment needed. "This workshop was mind-blowing with all of the simple, innovative cooking tips," said Valerie Marcellus, RDN, LDN, a clinical dietitian at the University of Pittsburgh Medical Center. "I love how interactive it was." Melinda Smiley, RD, a clinical dietitian at Eastern Oklahoma VA Health Care System in Tulsa, Oklahoma, said Dudash's workshop was the "best session I attended! Loved it! Very practical and useful." Like last year, TD hosted three breakfast presentations. They were "8 a Day: Surprising Facts About Strawberries and Health," presented by Leslie Redmond, PhD, RD, and sponsored by California Strawberries; "Inspiring Nutritious Morning Solutions," presented by Holley Grainger, MS, RD, and sponsored by belVita Breakfast; and "Functional Carbohydrates: A Review of Palatinose™ in Fueling an Active Lifestyle," presented by Christine Rosenbloom, PhD, RDN, FAND, and sponsored by BENEO Institute. What was new to this year's symposium was the addition of four lunch presentations on different topics that ran simultaneously. They were "Fiber Is More Than Just Roughage: The Emerging Role of Prebiotic Fiber on Gut Health," presented by Lauren Harris-Pincus, MS, RDN, and sponsored by Freedom Foods®; "The RD Toolbox: Supplements and Medical Foods," presented by Felicia D. Stoler, DCN, MS, RDN, FACSM, FAND, and sponsored by DIEM Labs; "Nutrition Above the Neck: Emerging Results on Seafood Nutrients for Brain Development and Health," presented by Tom Brenna, PhD, and sponsored by Seafood Nutrition Partnership; and "Step By Step Guide to Developing Wonderful Recipes for Media, Demos, and More," presented by Jackie Newgent, RDN, CDN, and sponsored by POM Wonderful (The Wonderful Company). We also provided the Dinner Theatre Presentation "Allulose: A Rare Find in Nutrition … and a Rare Opportunity for Society," sponsored by AlluLite Rare™ and presented by CEO Gerry Morrison. One of the highlights of the symposium was the grand opening of the exhibit hall. The hotel's catering staff served hors d'oeuvres and wine while attendees gathered brand information from our sponsors and sampled a wide variety of their food and beverages. The second day in the exhibit hall was just as exciting. Panera Bread® sponsored a delicious lunch for attendees that included a variety of sandwiches and salads (some of which were gluten-free and vegetarian and vegan friendly), as well as whole apples, sprouted grain rolls, fruit cups, cookies, and craft beverages such as unsweetened iced tea, prickly pear hibiscus fresca, plum ginger hibiscus tea, and papaya iced green tea. Amid the deafening din of dietitians interacting with sponsors and networking with one another, names of dietitians were announced at random to win all sorts of prizes donated by the sponsor companies. The winning prizes included large and small gift baskets and bundles, gift cards, lunch bags, books, beverages, and more. There were a total of 35 prize winners and one grand prize winner, who won free registration to our Spring Symposium in 2019 and three free nights at Talking Stick Resort in Scottsdale, Arizona. This year's sponsors included: a2 Milk®; AlluLite Rare™; The Art of Pecan; Basic American Foods™; Beetnik®; belVita Breakfast; BENEO Institute; California Raisins; California Strawberries; Canned Food Alliance; Carlson®; CBORD®; CinSulin®; DIEM Labs; Diversified Foods, Inc; Egg Nutrition Center; fairlife®; Foods With Judes; Freedom Foods®; Functional Formularies®; Good Idea®; Great Lakes Gelatin®; Hormel Health Labs; LaCroix® Sparkling Water; Monsanto Company; Orgain®; Panera Bread®; Premier Protein®; Pyure® Organic Stevia; The Quaker® Oats Company; Rachel Pauls Food; Rational Foods®; REAL FOOD BLENDS™; Red Bull; Regular Girl®; Seafood Nutrition Partnership; Simple Mills®; SmartLabel™; Sorghum. Nature's Super Grain®; SPLENDA® Sweeteners; StarKist®; Sunsweet Growers; Walden Farms®; Welch's®; and The Wonderful Company. Many of the dietitians said they enjoyed the exhibit hall and the variety of companies present. "I thought there was a nice array of companies with great swag," Agnew said. "[And there were] lots of yummy snacks!" Esther Tambe, MS, RD, CDN, said, "I enjoyed all the vendors that were in the exhibit hall. And I was able to learn about new products to provide to my clients." Elizabeth Green, RDN, CDN, a clinical dietitian in Jordan, New York, said, "There were always new and interesting things in the exhibit hall, as well as some familiar staples. I got some great information to use personally and to share." Also in the exhibit hall, presenters including Toby Amidor, MS, RD, CDN; Dudash; Mary Litchford, PhD, RDN, LDN; Palmer; Kate Scarlata, RDN, LDN; and Scritchfield featured copies of their books for purchase and were available for discussion with attendees. One of the most unique and much-anticipated events was the bat watching dinner cruise sponsored by Regular Girl® that sailed along Austin's historic Lady Bird Lake. The cruise provided dietitians the opportunity to watch between 750,000 and 1.5 million bats emerge at dusk from under the Ann W. Richards Congress Avenue Bridge. Each night during the spring and summer, crowds of people gather on the bridge in hopes of seeing the massive flurry of Mexican free-tailed bats spiral into the sky. As dietitians sailed and waited for this momentous spectacle, Stoler, clad in black shorts, black cowboy boots, and a black bat-winged mask, welcomed attendees and thanked everyone for joining her and her crew for special Regular Girl® cocktails, chocolate, and dinner, which included Texas-style BBQ, vegetables, salad, pasta salad, and bread. The cruise spanned four hours of nonstop networking, camaraderie, feasting, and fun. Between 8:30 and 9 PM, the cruise passengers saw the colony of bats fly out of the crevices beneath the bridge and were mesmerized. During the symposium, TD thought it was important to get attendees' hearts pumpin', muscles flexin', bodies movin'—and sweatin'—so we offered a 6:15 PM yoga class called "Pints and Poses," sponsored by Hormel Health Labs and led by Mandy Unanski Enright, MS, RDN, RYT, and a 6:30 AM high-intensity bootcamp workout session called "Operation Endure," sponsored by BENEO Institute and led by Tazz Tucker, NASM-CPT, FNS. Both exercise sessions were filled to capacity as attendees burned calories, improved overall fitness, and enjoyed networking with fellow yogis and cardio fitness enthusiasts on the Zilker Terrace at the hotel. TD also created lots of social media buzz around the symposium by encouraging all attendees to use the hashtag #TDinAustin for all of their posts and tweets. The staff tweeted photos and comments in real time throughout the event. Our hashtag received 1.5 million impressions on Twitter with 163 people participating. We also launched a new symposium-specific Instagram page that garnered 400 posts and is still gaining followers. Sponsors and attendees also used Facebook to post comments and photos from sessions and live video from the exhibit hall. Scarlata tweeted, "Another fantastic @TodaysDietitian symposium this year! Grateful for the opportunity to speak about digestive health. Great sessions, networking with colleagues, exhibits, and sponsors. Highly recommend—next year it's in Scottsdale, Arizona." Monique Richard, MS, RDN, LDN, RYT-200, tweeted, "Inspired by my colleagues. Dietitians are doing amazing things, thank you Today's Dietitian for bringing us together in Austin." Elissa R. Lueckemeyer, RDN, LD, tweeted, "Great time at @TodaysDietitian spring symposium. Now I just need to get to work on improving my social media outreach, food photography, recipe development, self-publish a book, put myself on FB live, and do some cooking videos! No sweat!" Ginger Hultin, MS, RDN, CSO, tweeted, "The best thing about conferences is hanging out with your buddies." Moore tweeted, "Thanks @TodaysDietitian for the invitation to speak and a fantastic conference!" Hands down, TD's 5th Spring Symposium was our best to date. Attendance was up over last year, and more sponsors came to support us. Everyone enjoyed themselves, and many are looking forward to joining us next year in Scottsdale, Arizona—the Valley of the Sun. One attendee said the entire TD staff did a "great job! This was my first time coming to your event, and it was great!" Another attendee said, "Thank you for putting on such an amazing conference." And yet another told us, "This is the best conference I've ever attended, and I've been to many." So come join us next year in Scottsdale. We can't wait to see you there! 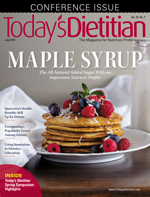 — Judith Riddle is editor of Today's Dietitian and RDLounge.com, the blog written for RDs by RDs.